With so much evidence emerging about the harms of excessive meat and dairy consumption, nuts and seeds are now taking over the protein spotlight. These natural foods are tasty, have more protein than grains, are good sources of polyunsaturated fat, vitamins (A, D & E), minerals (Fe, Zn, Cu, Ca, K, P, I) and are much cheaper than meat and dairy. Legumes also fall within the category of seeds. Specifically, legumes refer to dried beans, lentils and peas. Historically legumes have been the main source of protein for most of the world for about 8000 years. Presently there are 13, 000 different varieties of legume grown worldwide. Unlike the damage caused to the earth by the overgrowing livestock ranges, legumes actually replenish soil with nitrogen. So-much-so that farmers would even grow beans between rows of corn, a grain that depletes the soil of nitrogen. Legumes are high in carbohydrates, soluble fibre, minerals (especially iron, potassium, calcium, zinc) and vitamins (especially the B vitamins and folic acid). They also contain very little, if any, fat and cholesterol. Even though legumes are a good source of protein, they are considered an incomplete protein because they are low in the essential amino acid methionine. This shortcoming can nevertheless be very easily overcome when legumes are combined with grains, foods that legumes are most normally eaten alongside. A complete protein source is considered one that possesses all the vital amino acids for every living cell. That means a combination of over 20 amino acids, 8 of which must be obtained from our food as the body cannot produce them. These 8 amino acids are therefore called the essential amino acids. Nonetheless, research has shown that diets do not necessarily have to have a complete spectrum of amino acids in every meal. Amino acids ingested at other times can complete deficiencies from past meals without difficutly. If there were any negative points about legumes then it should perhaps be stated that legumes contain a high level of purines. Purines are a protein that should generally be avoided by sufferers of gout because they increase levels of uric acid which can precipitate a gout attack. Legumes also often cause flatulence when first eaten after a long while, but with continuity the body can become accustomed to producing the adequate level of enzymes needed for their digestion. Legumes have been shown to lower cholesterol because of their soluble fibre content and help stabilize blood sugar levels because they provide a slow, steady supply of glucose. introduce legumes into your diet slowly to give time for your digestive system to adapt. Dried legumes can be stored in airtight glass jars away from heat and light for 6 months to a year; vitamin B6 deteriorates when the legumes are exposed to light. Cooked legumes will last up to 5 days if stored in the refrigerator or they can be stored in the freezer for up to 6 months. one of the most popular legumes in N.A. Nuts have been called the ‘meat of the plant world’. They too, however, are low in certain amino acids such as tryptophan and methionine. As such, a diet containing grains, as is likely, is needed to complete the amino acid balance. 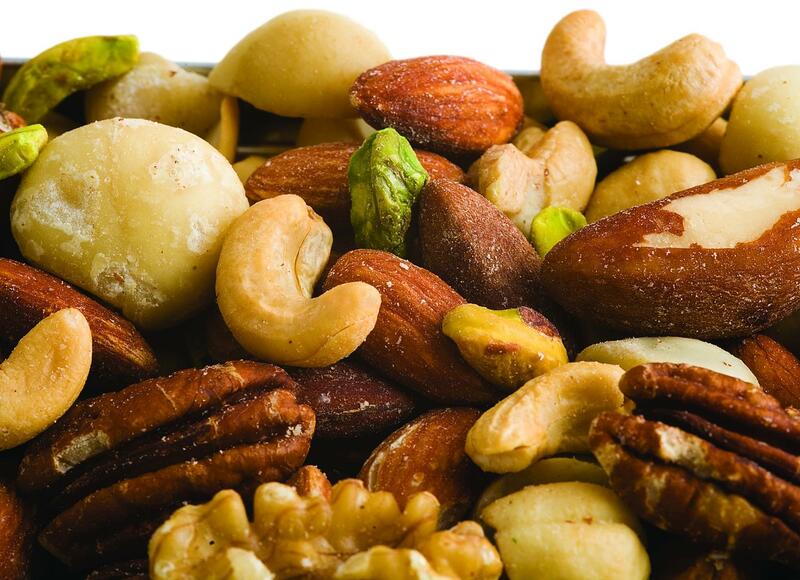 Nuts have also been found to be higher in oils than seeds, and rich in protein and minerals (K, Mg, Ca, Fe, Zn, Se, Mn). Both seeds and nuts are typically the best source of vitamin E.
It is always best to buy fresh, organic (toxins accumulate in seeds and nuts due to their high oil content), raw, unshelled seeds and nuts. Store hulled seeds and nuts in non-plastic containers in cold places (refrigerator/freezer) to preserve their oils. The best way to enjoy seeds and nuts is soak them overnight to initiate the sprouting process, this will make the fats and proteins more digestible; dry and eat raw. Lightly roasting seeds and nuts reduces the effect of rancidity and makes nuts easier to digest also, but overheating can transform the oils into a harmful state. As heart disease, cancer, diabetes, and a long list of other diet related illnesses keep affecting higher and higher percentages of the population, people will begin to look for ways to alter their eating patterns. Most people currently consume more protein than the average person requires mostly in the form of animal products. Meat and dairy are filled with saturated fats that, although necessary in the diet, have been correlated with many of the above mentioned conditions when eaten too often. Vegetarianism may not be right for everyone, but increasing non-animal based products in the diet does have its benefits. For those wanting to make a few healthy changes, nuts and seeds will be good choices in place of the meat and diary that is the usual source of most peoples’ protein.